The surrender of Burgoyne at Saratoga in 1777 was looked upon as the "turning point of the Revolution" , but this area was dangerous through the end of the war. The story of Major VanVeghten really illustrates the great variety that can exist in the supposedly factual reporting of an incident. Solomon Acker was the only source for this story, and his account must have varied widely as he told that story many times over the years. In his Revolutionary War pension papers, Mr. Acker states he was with Major VanVeghten at Schaghticoke in July 1777 when VanVeghten was “shot by the Indians,” and that Mr. Acker killed one of the Indians himself. He states, “Immediately I raised a guard and warned the inhabitants, and assisted them in removing to Albany.” Sylvester, in his History of Rensselaer County sets the event in August, and describes the area as deserted, as everyone had already evacuated to Albany. He states the men were on the land of Jacob Yates, when “they were fired upon by Indians or perhaps Tories.” He adds that VanVeghten was shot through the tobacco box, which was handed down in his family, and that the Major, realizing that he was mortally wounded, yelled, ”Solomon, take care of yourself; you cannot save me.” Acker fled reluctantly, “with the bullets pattering around him,” reaching the Army safely. Mr. Acker told this story, apparently much embroidered from the version in the pension papers, to two local men,who told it to Sylvester. They even pointed out the spot on the farm of W.V.V. Reynolds where the murder occurred. This was probably near the intersection of Farm to Market Road and Howland Avenue Extension. A memoir written in 1866 by John P. Becker, Sexagenary, Reminiscences of the American Revolution, really takes the story to fiction, describing the circumstances of each shot taken by VanVeghten, Acker, and the enemies, going on to describe Acker’s flight step by step, and stating that when the Americans went to retrieve VanVeghten’s body, they found “ him hacked to pieces and scalped, and…three Indians dead in an adjacent field.” It also places the event as occurring after the battle of Saratoga. Who knows if Mr. Acker told the story this way or if some source of Becker added to it? The memoir states that Van Veghten was buried in Albany, but “his unfortunate wife was not permitted to see the corpse, it was so savagely mutilated.” Whatever the truth of this particular incident, it confirms the danger in the area during that summer of 1777. It makes the most sense that it happened before the battle, as presumably enemies in the area would have either been captured or have retreated after the battle. As I reported earlier posts, the 14th Albany County Militia was certainly called to duty during the summer before and through the time of the battles of Saratoga. This means that many families were evacuated from home and had to survive without their husbands and fathers, though they may have had help from some militia men during their evacuation. In addition, most people were away from home at harvest time. After the battle was over, about 6000 British and Hessian prisoners of war were evacuated to Boston, probably crossing the Hudson in boats or over a bridge of boats at Stillwater, and passing through the town of Schaghticoke. This probably resulted in more damage to fences and farms. I find it difficult to look around our town now and imagine it on the edge of the battle that was the turning point of the Revolution, to imagine how I would feel if I were forced to evacuate my home, how I would feel to return home and find my property in ruins. During and just after the Revolution, Schaghticoke was not only on the border of American and British territory, but also on a second controversial border. I will discuss that in the next post. Bibliography: Fitch, Asa, Their Own Voices, reprint 1983. Kloppott, Beth, History of the Town of Schaghticoke, 1980. Sylvester, Nathan, History of Rensselaer County, 1880. Becker, John P. Sexagenary, Albany, Munsell, 1866. One reason for the confusion over when Indians killed Major Dirck VanVeghten of Schaghticoke is that there was a second Derrick Van Vechten involved in the campaign of 1777. He was a private in the Tryon County Militia and fought in the battle of Oriskany on August 6, 1777. He survived the battle and lived a long life, dying in 1847 at the age of 92. He is buried near his home in the Van Vechten cemetery near Pattersonville, N.Y., and his grave is marked with a DAR flag. Private Derrick of Pattersonville’s father, Hubartus, was third cousin to Major Dirck of Schaghticoke, both descendants of early Rensselaerswyck farmer Teunis Dirckse Van Vechten. With regard to a possible date. I’ve done a bit of research based on my interest in the 3rd NH Regiment. At least two companies from the regiment were tasked with assisting the villagers from Schaghticoke in evacuating to Albany. This comes from a narrative given late in life by Joseph Gray of Wilton, NH, who was in Isaac Frye’s company, and he also mentions “Mr. Ellis” who is likely Captain William Ellis of the same regiment. https://archive.org/details/historyoftownofw00live (page 247). Gray provides a very similar story. 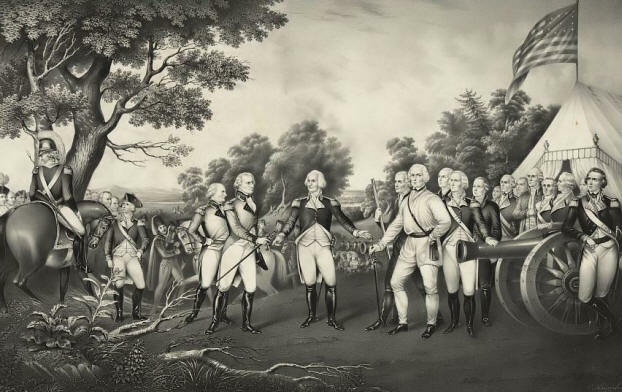 Between Gray’s narrative and journals of other men in the regiment, particularly Major Henry Dearborn, I think Frye’s and Ellis’s companies left Stillwater for Schaghticoke on the afternoon of August 4, 1777, likely in the company of Major Van Veghten and Mr. Acker. That puts the likely date of the incident is August 5, 1777. Such an interesting account, one more example, I think, of the problems of memory and point of view in establishing what really happened. This account doesn’t say that VanVeghten died and was scalped. huh. more research needed! Got to love the Internet for providing the basis to connect the threads of history!